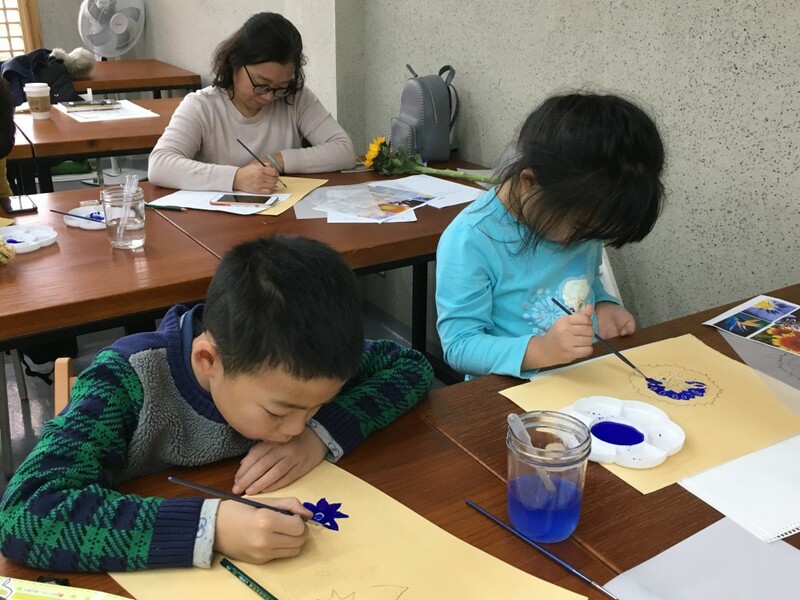 Last month I had the pleasure of teaching at the Jia Yuan Hall Prince’s Foundation School for Traditional Arts in Suzhou, China. This was an extraordinary trip. 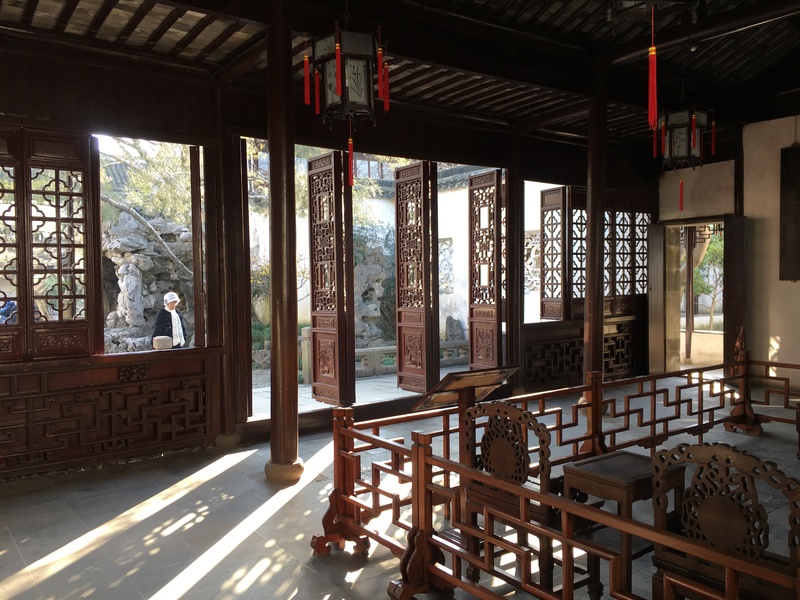 So much so that I hardly know where to begin in describing the beauty of my surroundings and the understanding, etiquette, appreciation, hospitality, and conscientiousness of my students and hosts. 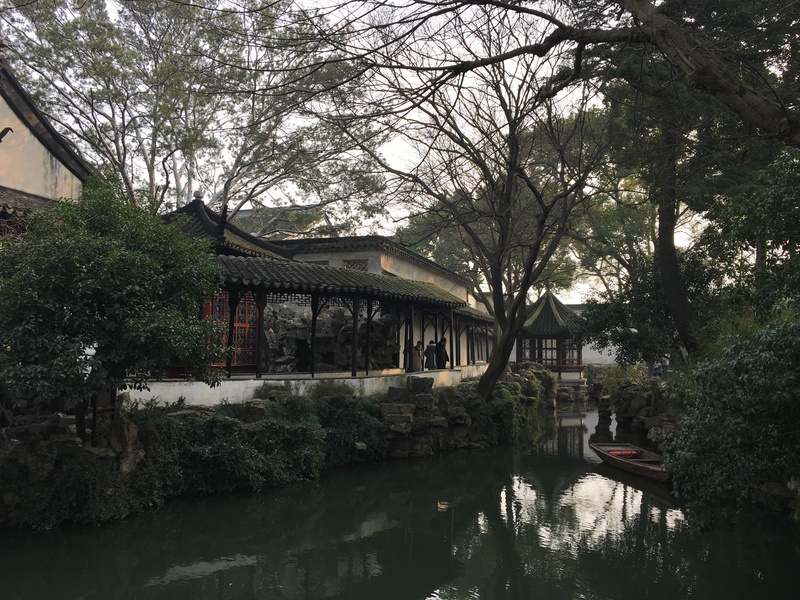 Suzhou is based in the delta of the Yangtze River, about a two hour drive from Shanghai airport. 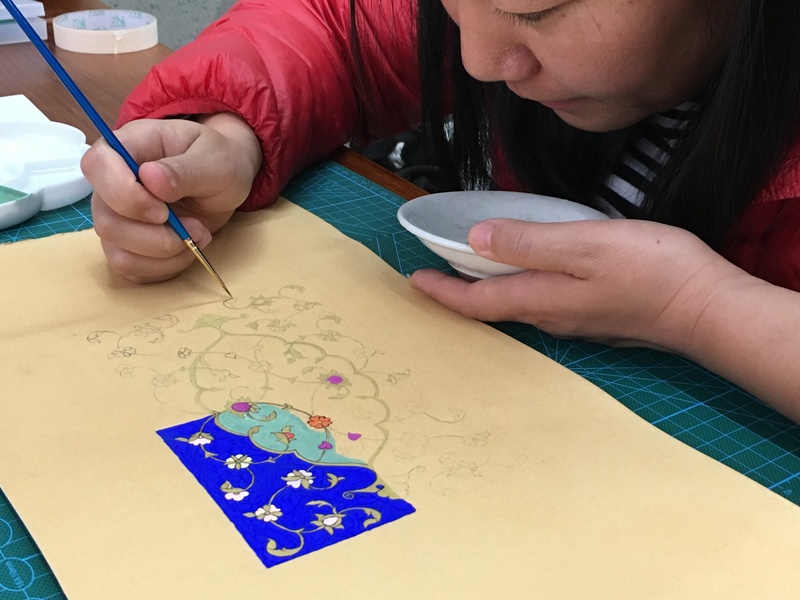 For centuries it has been an important stop on the ancient Silk Road, specialising in the trade and production of silks, jade ornaments, and pearls. 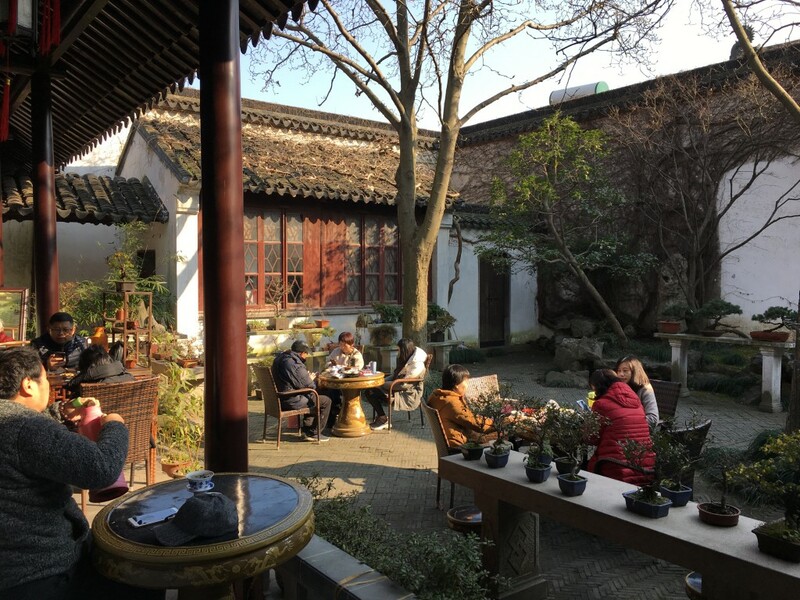 Historically home to the intelligentsia and government officials, this city of canals is filled with traditional Chinese mansions and their exquisite landscaped gardens. 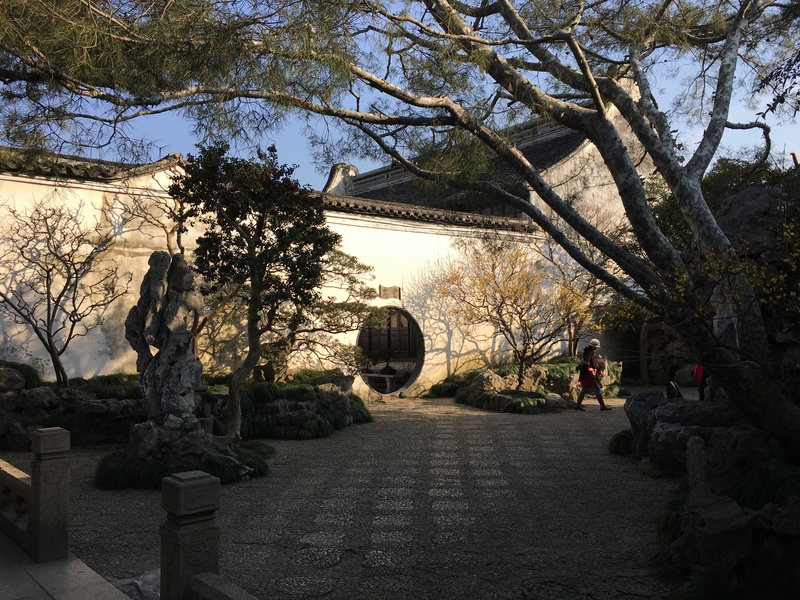 Many of these gardens are now UNESCO world heritage sites open to the public. Exploring these gardens was like stepping into a fairytale. I can’t even imagine how one might begin to design something so exquisitely beautiful. As I wandered through these gardens I was struck by how every viewpoint and angle was perfect.  Yet at no point did the design look forced or contrived. I have nothing but the highest respect and admiration for the minds behind these stunning natural works of art. 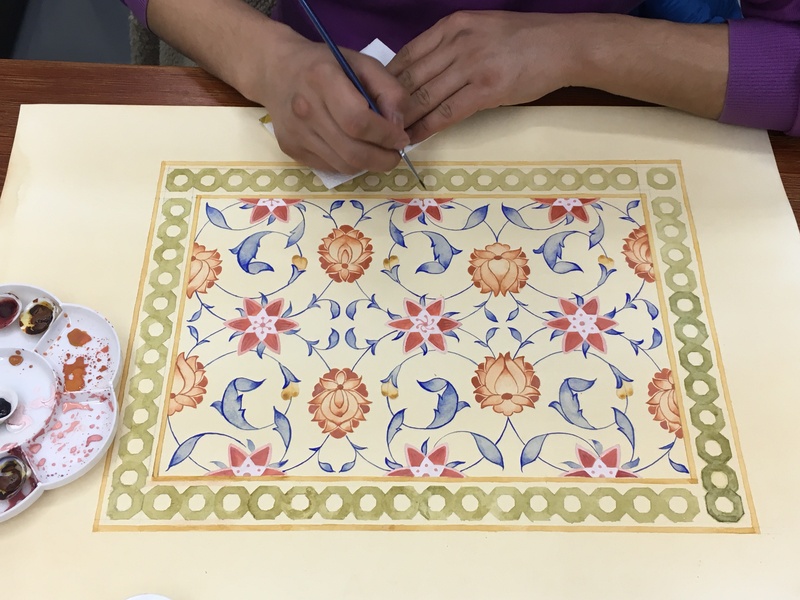 I was away for two and a half weeks, during which I taught a 10-day workshop for diploma students at the Jia Yuan Hall School, led a one-day workshop on Islamic pattern for the public, and had a few days to rest and do some sightseeing. 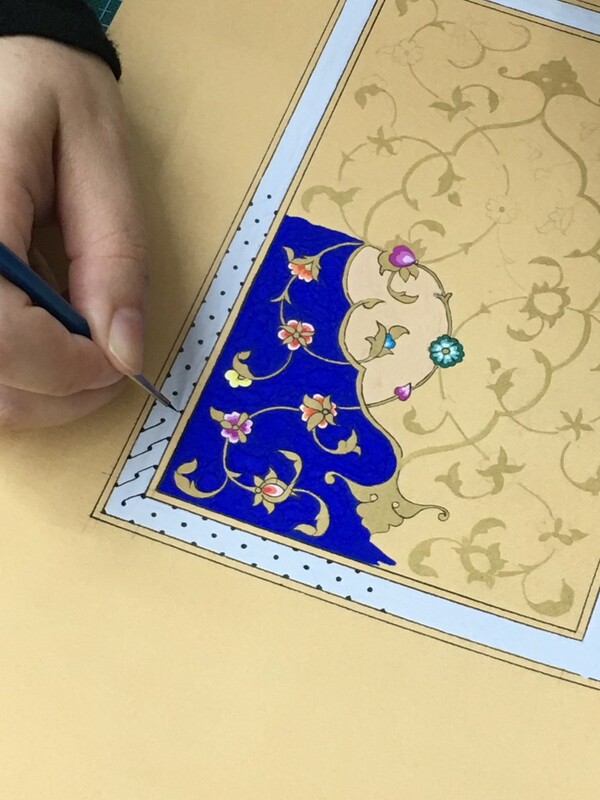 The workshops focused on nature-inspired pattern in Islamic art, and the cross cultural influence of Islamic and Chinese art through the Silk Road trade. 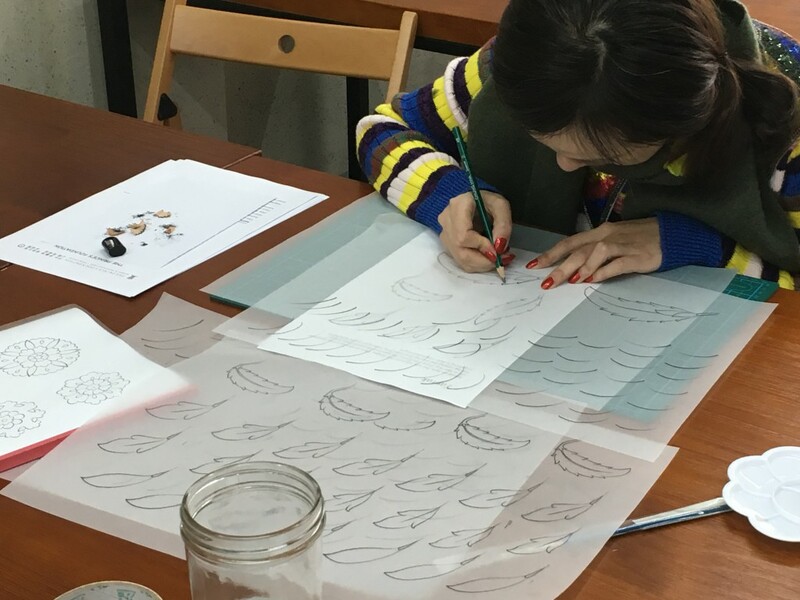 The practical part of the course started as all my courses begin: with lots and lots of pencil and brushwork practice! 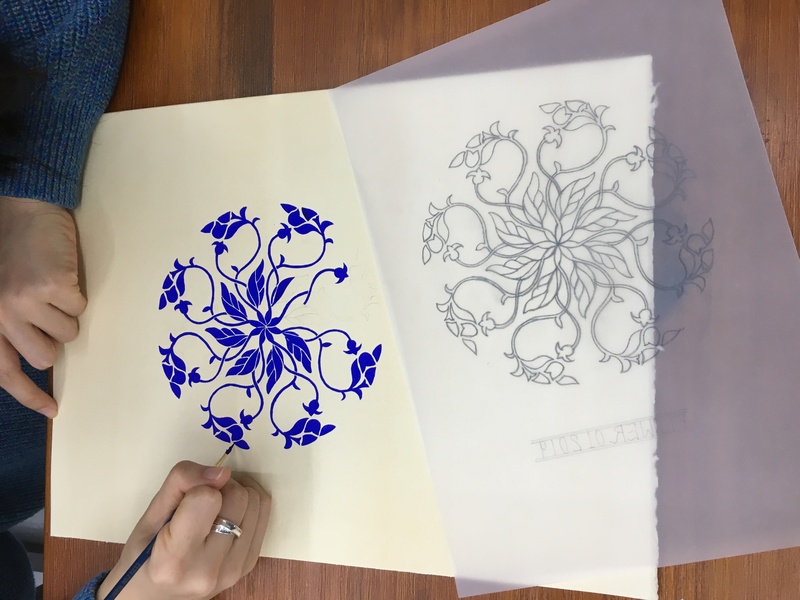 This is important because it trains students to familiarise with making the smooth curved lines needed for tezhip, or indeed, islimi (nature-inspired design in Islamic art). It also helps to sensitise the hand to various line weights and pressures with the pencil and brush. 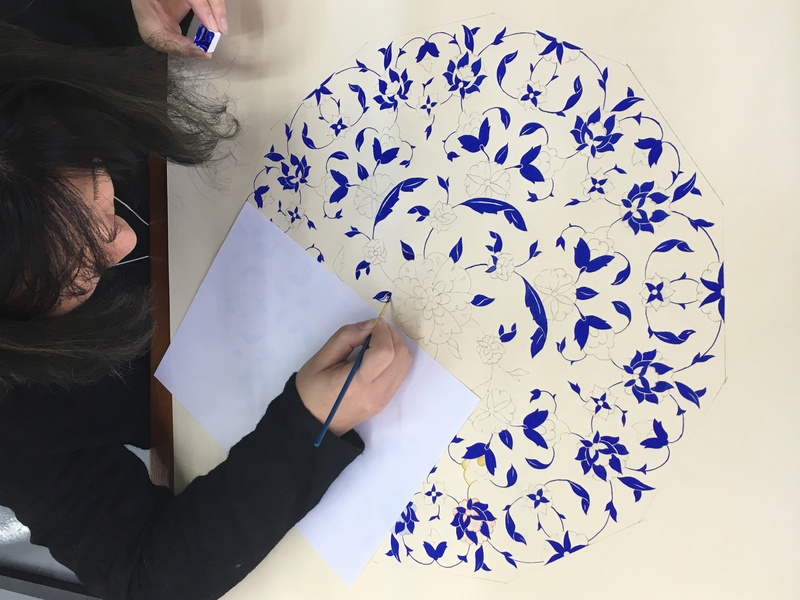 In the first week of the 10-day workshop, students learnt traditional painting techniques used to illuminate a pattern containing a hatayî and bird motif. 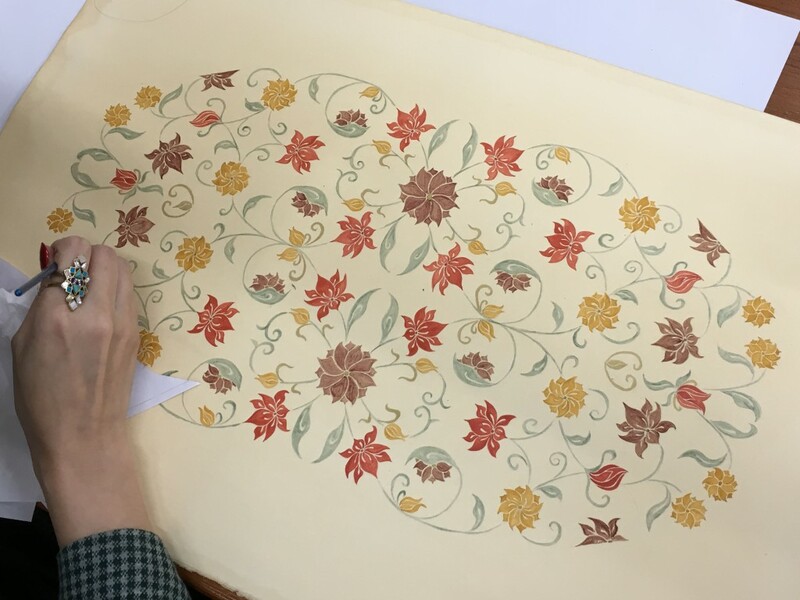 They practiced shading the design with shell gold – a paint handmade from ground gold leaf. In fact, we made the shell gold ourselves earlier in the week, then used it to paint the compositions. 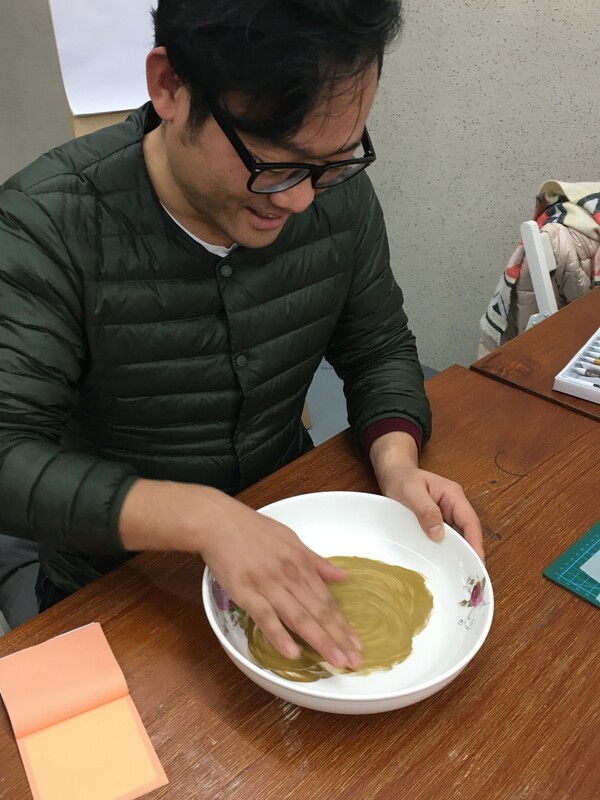 Grinding gold leaf to make shell gold paint. 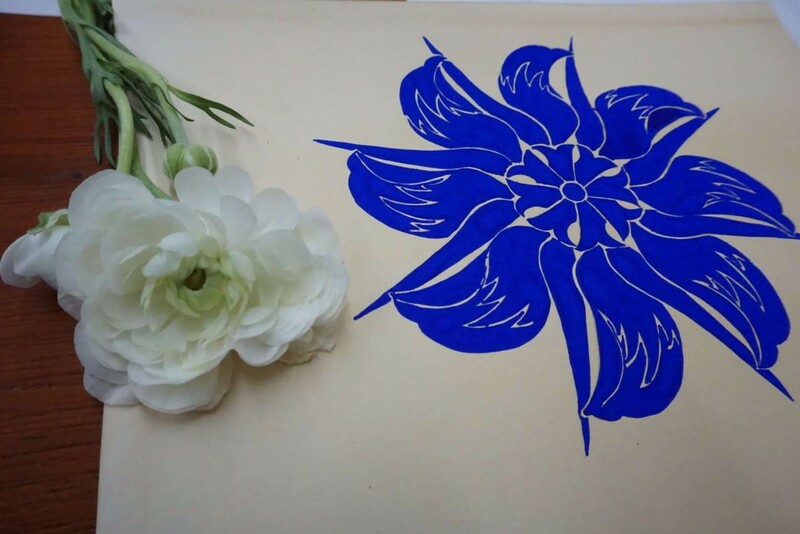 Students also learnt a classical tezhip style using tiny coloured flowers on a blue background. As our time was so short, I asked students to just complete one quarter of the composition so they could work through all the various processes involved in illuminating a manuscript on a small, manageable scale. With that knowledge, they could complete the rest of the design in their own time. 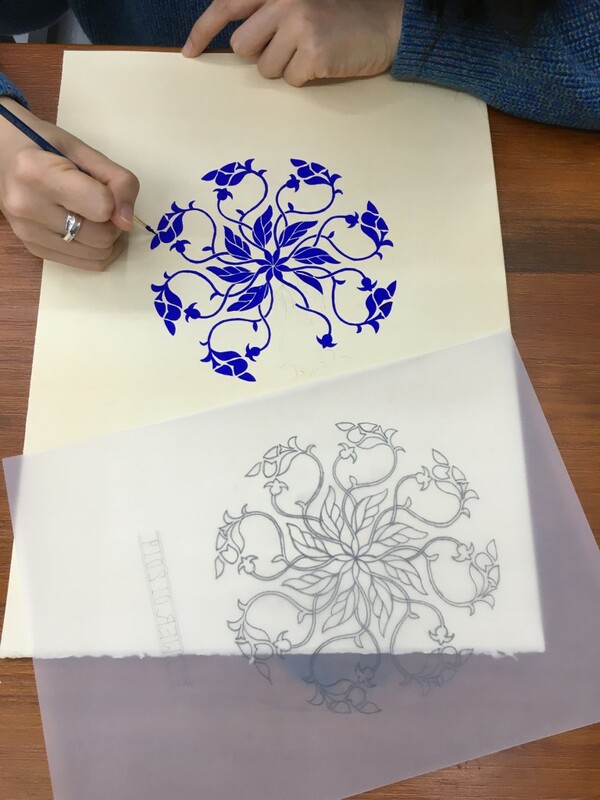 However, they were so keen and conscientious that the entire class stayed late and several students finished the pattern within the first week! 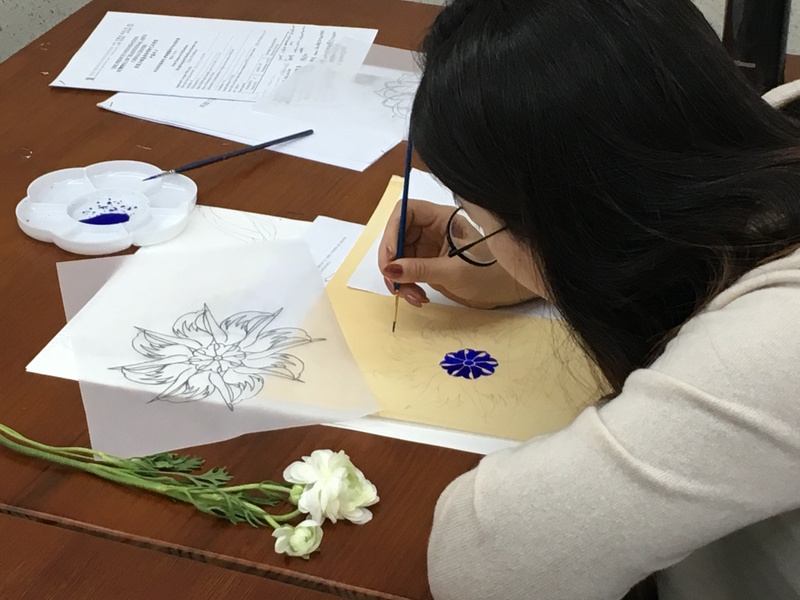 Students on the one-day public course had the opportunity to design and paint their own fantastical flower inspired by islimi - nature-inspired patterns in Islamic art. 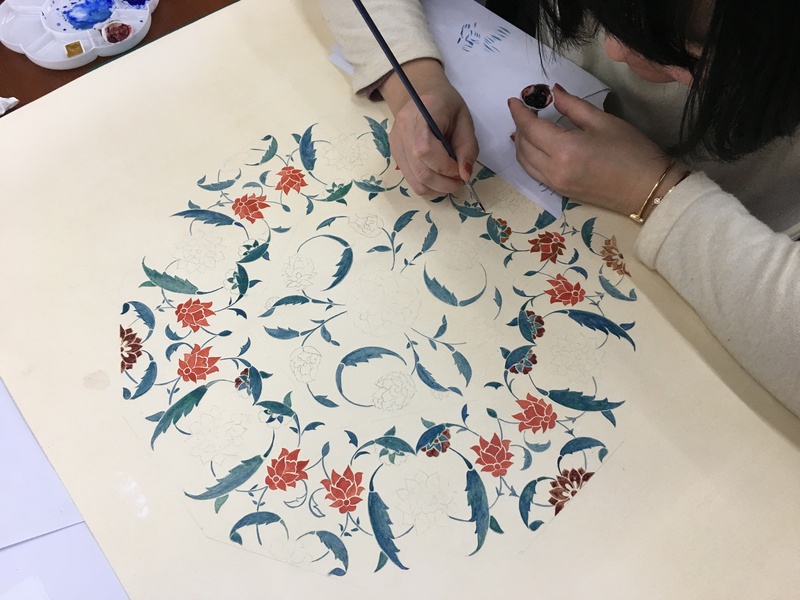 After a short presentation on biomorphic forms in Islamic art, we went right back to the source of these patterns – the natural world. Students made sketches of plant and flower shapes to inspire their stylised designs. My little artists did a great job, too! If I had to pick my highlights of the trip, two moments in particular stand out. 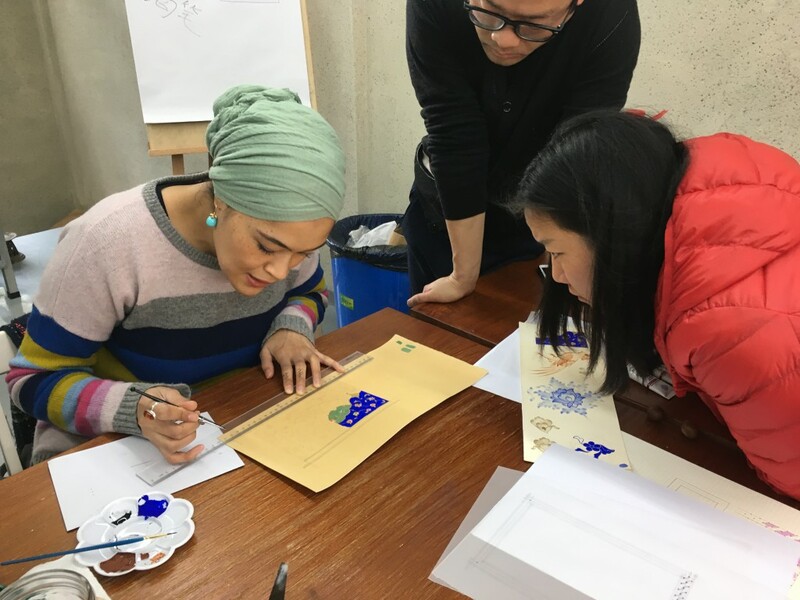 On the first day of teaching, I delivered a presentation attended by Jia Qin, a Master of ancient Chinese characters. 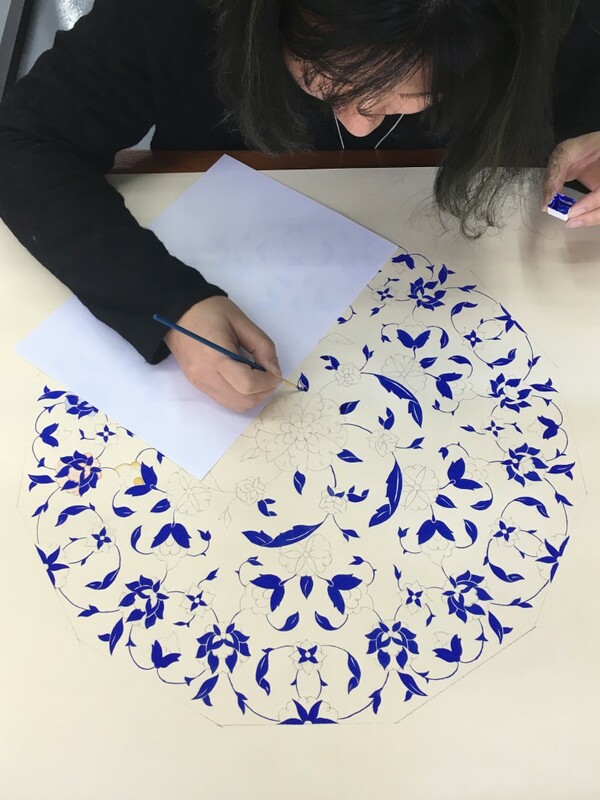 At the end of my talk, we had a conversation (though a translator) about Arabic and Chinese calligraphy, and how these two arts may have influenced one another in the past. 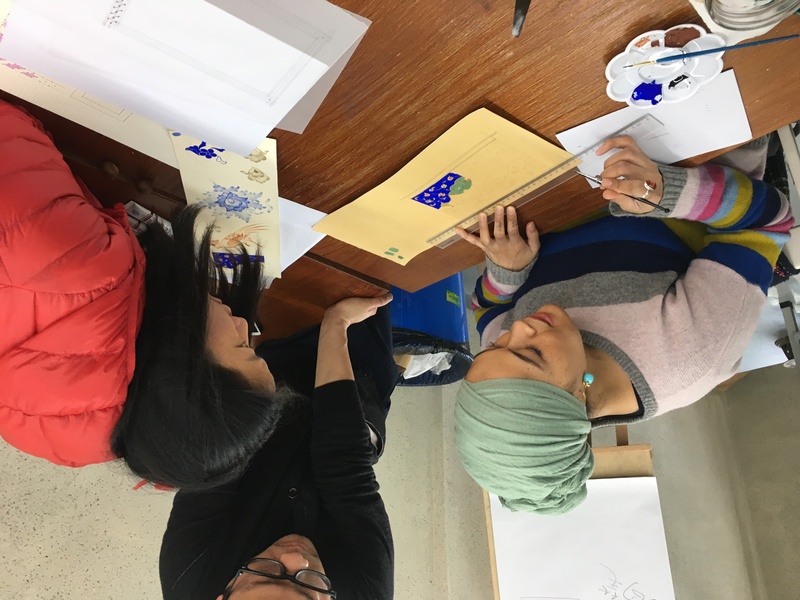 Jia Qin showed me an angular Chinese script, similar in aesthetic to kufic calligraphy. He explained that these characters are no longer used in contemporary Chinese writing. 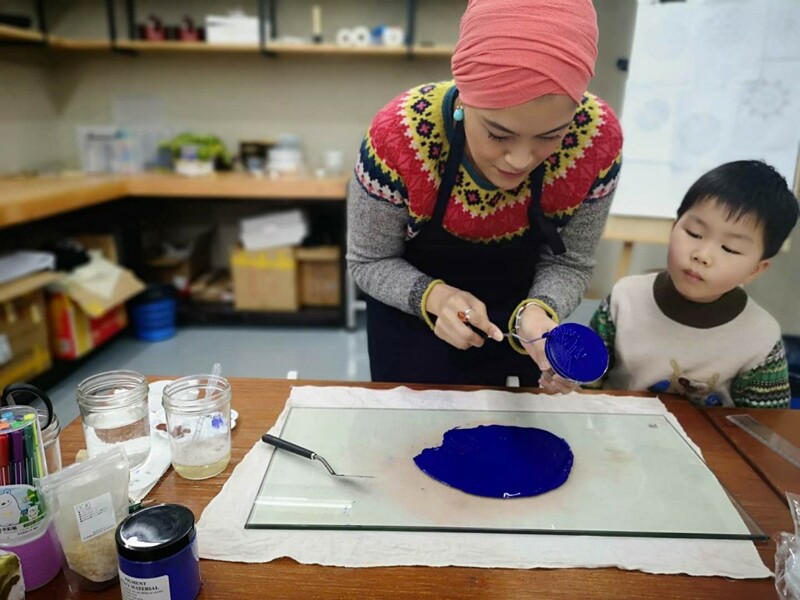 We also discussed the etiquette and pedagogy in studying traditional crafts in the Islamic and Chinese traditions, and I showed Master Jia Qin some images of my hilye. 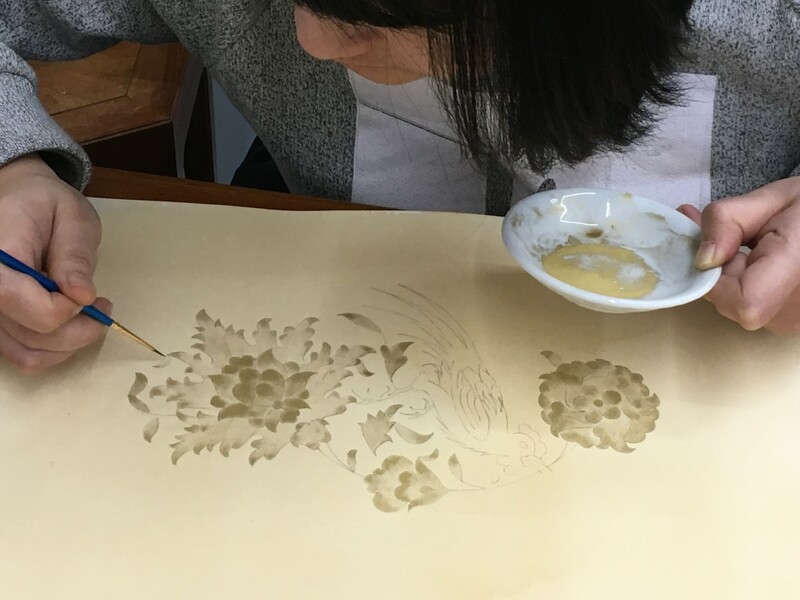 At the end of our conversation, the scholar told me that he would like to make me the gift of a seal, bearing my name in Chinese characters. 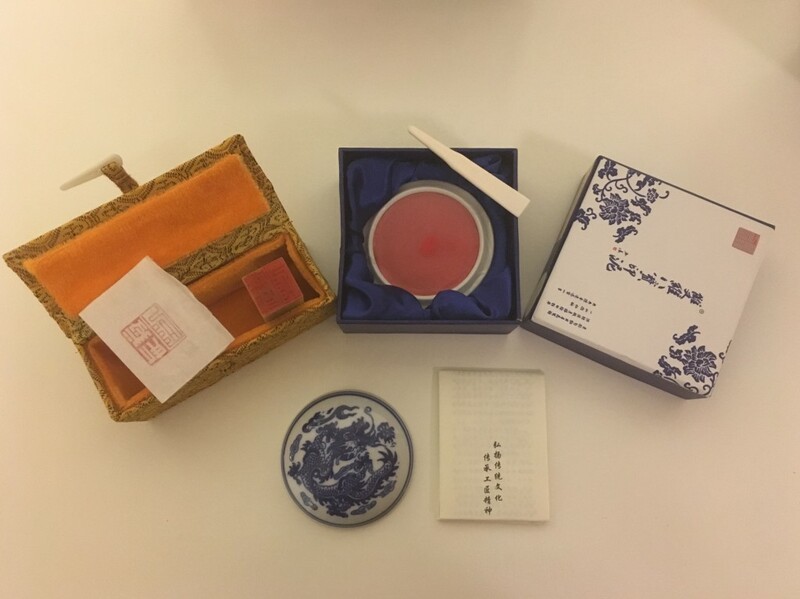 I was very, very moved by this generous and thoughtful gift. The characters are ancient Chinese letters. According to my Chinese colleagues, Master Jia Qin probably picked the angular style of writing because it resembles Arabic kufic calligraphy. I’m so very touched by this precious gift. I would love to present him with something of equal meaning and beauty in return, but will have to think very hard about what might be suitable. 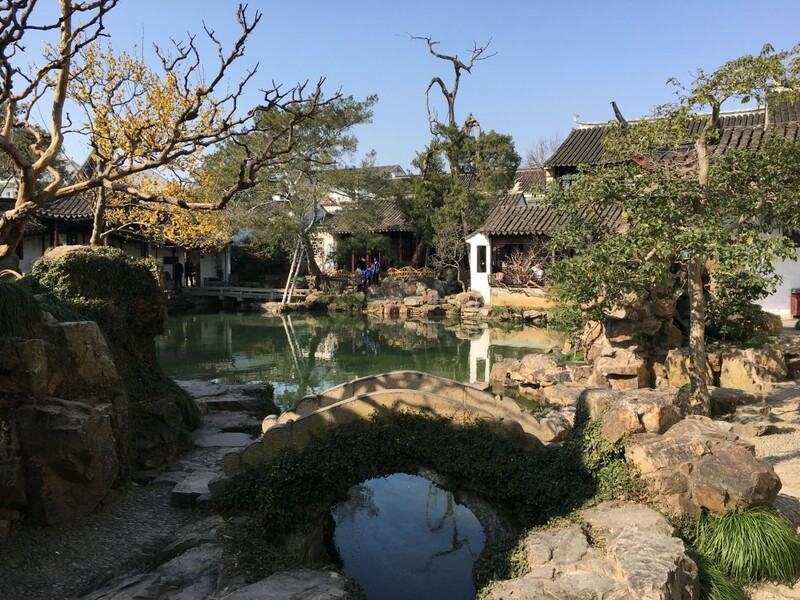 To end this post, I will share with you a second memorable moment, a very sweet scene that unfolded on my final day in China. By this point, all of my students and most of my colleagues had returned home for the Chinese New Year holiday. Left to my own devices with no translator to accompany me, I decided to visit one of the nearby gardens, a short walk away from the apartment I was staying in. It was my favourite type of weather – mild, but brisk, fresh air with blue skies and sunshine. I took my sketchbook and some drawing materials in the hope of finding a quiet spot to sketch. I wandered around looking for an interesting perspective, somewhere comfortable to sit that was not overrun with children on a school trip. Having found my spot, I settled to work. About 45 minutes into my sketch, just as I was adding texture to some of the trees and refining the rock shapes, a couple of newlyweds walked straight into my frame to take their wedding pictures! Take a look at the short movie I made here. It was so sweet, and so unexpected. It felt like it was another little gift for me, and it really put a smile on my face. When I complete that sketch, I’ll add the newlywed couple with their red parasol to my drawing. 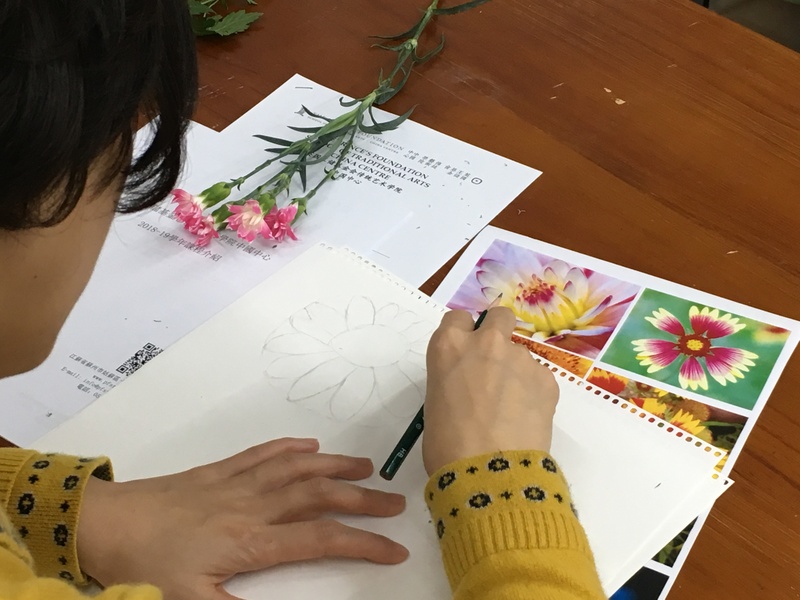 Thank you Suzhou, and thank you to the staff and students at the Jia Yuan Hall arts school for welcoming me. I hope to see you again soon! 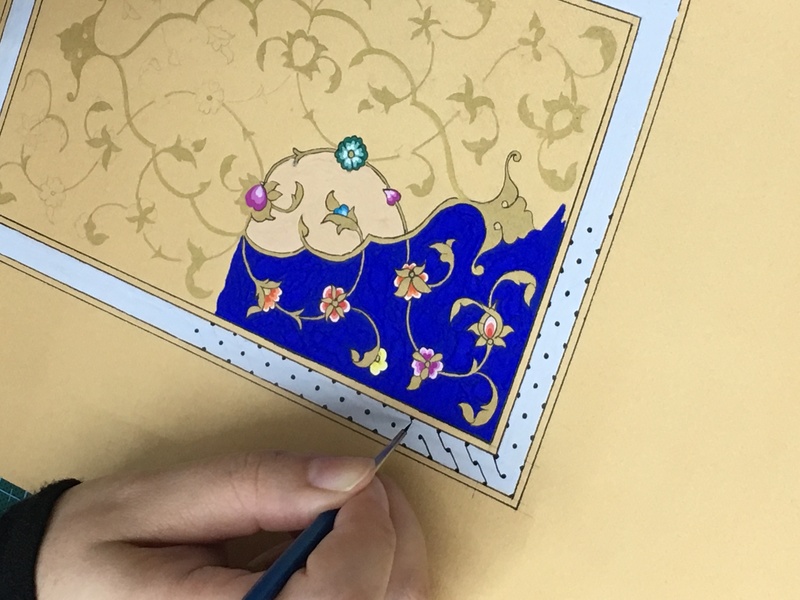 This entry was posted in Islamic Art Courses, Islamic Manuscript Illumination, News, Pattern in Islamic art, Student's Work, Teaching, Tezhib, Travels, painting, tezhip. Bookmark the permalink.